Watching tadpoles transform from fishlike creatures to frogs is fascinating for adults and children both. Keeping pond tadpoles alive at home is easy to accomplish with very little expense or time. The main requirements are a container with clean water, appropriate food and shade. You'll find tadpoles in ponds and creeks during early spring. Use a fine mesh net to scoop them gently out of the water before placing them in a container of clean, chlorine free water. Catch only a few tadpoles at a time, since you should not keep more than two tadpoles per gallon of water. You can order tadpoles online or purchase them from some pet stores. Simple is best when creating a habitat for tadpoles. Substrate, plants and decorations are not necessary. Fill a fish bowl, aquarium or container with water that is completely chlorine free and place it in an area where it is at least 95 percent shaded. Do not use chemical cleaners on the container, as they may be toxic to tadpoles. Once the back legs begin to develop, and a few rocks that stick up out of the water so they can get on them when they are ready. Change the water when it appears cloudy, being sure to always use chlorine-free water. Some pet stores and online retailers sell flakes and pellets made specifically for tadpoles, but you can feed them from your kitchen. Boil spinach or any type of lettuce besides iceberg for 10 to 15 minutes and drain it well. After draining, chop it in to the smallest pieces possible. Feed a tablespoon per tadpole once a day. You can spread leftover lettuce on a wax-paper-covered pan and freeze it. After it is completely frozen, place it in an airtight container in the freezer. Rabbit food pellets make good tadpole food. Simply crush some up and sprinkle into the water. Boiled eggs are suitable treats. Whatever you feed them, scoop out any uneaten food after an hour. 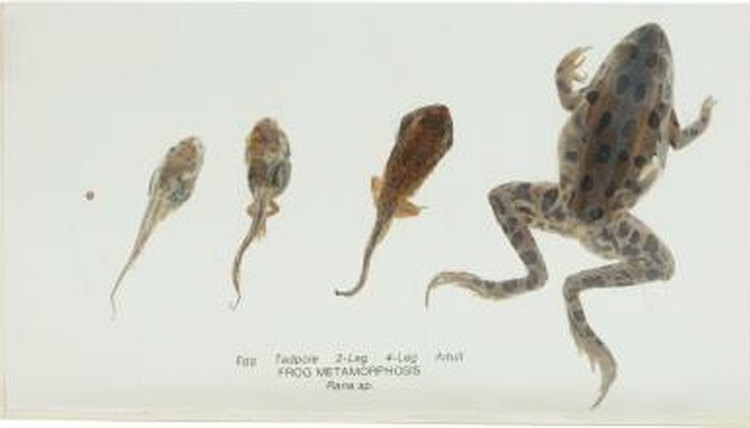 The time it takes for a frog to develop completely depends on the type of frog or toad the tadpole is destined to become. A blanchards cricket frog will develop in only 5 weeks, while a bull frog can take up to 14 months to turn fully in to a frog. Back legs will appear first, growing slowly in to fully formed legs. The front legs will follow. The tail will gradually get smaller as the tadpole absorbs it for food to fuel his journey to frog. The final step is twofold: adapting to breathing with lungs rather than gills and changing in diet from plant matter to small insects. What Is the Difference Between Polliwogs and Tadpoles?